Let’s start with the obvious statement—any inflatable raft can be used for fishing. Well, scratch that. Any inflatable raft that floats is suitable for fishing. So that begs the question, what is an inflatable fishing raft? And why would an angler want one? An inflatable fishing raft is a raft designed specifically for fishing. Can these rafts be used for recreational floating? Sure. However, these rafts make no effort to conceal their true purpose—which is fishing. Unlike standard inflatable rafts designed for recreational floating, inflatable fishing rafts come with a myriad of equipment and optional features that anglers often desire. These features range from rod holders, to motor attachments, to swivel seats and even canopies. The purpose of this article is to introduce angler’s to dedicated inflatable fishing rafts—or those designed specifically for serious fishing. Do You Need an Inflatable Fishing Raft? So who needs an inflatable fishing raft? Anyone who fishes and needs a boat, right? Casual anglers, or those who only occasionally fish or spend more time doing recreational floats instead of chasing bass or trout, can save money by going with a less expensive recreational inflatable raft. These rafts—exemplified by the Sea Eagle 9 Motormount—are durable and very flexible. While they lack many of the features dedicated anglers seek, such as swivel seats, ability to stand while casting and rod holders—they still work quite well for just occasional fishing. And should your fishing needs change, upgrades are available to allow trolling motor attachments and floorboards. Ultimately, anglers need to decide how much they fish and whether a dedicated fishing raft is worth the extra expense. That said, for anglers who fish frequently and seek to maximize their productivity while on the water, there’s no doubt that an inflatable fishing raft is an ideal boating platform and is worth the money spent. Once upon a time, anglers had few choices if they wanted an inflatable fishing raft. And as far as frames went, you had no choices at all. It was “raft with frame or bust,” you might say. However, today it is a far different story. New technology—in particular high-pressure drop stitch floors and increased fabric strength—has allowed frameless rafts to rival their framed cousins in handling, whitewater performance and options available. And the frameless rafts are much less expensive. But let’s back up for a minute. What is the difference between an inflatable fishing raft that has a frame—and one that doesn’t? A picture is worth a thousands words, so below are examples of a frameless fishing raft, a traditional whitewater raft with fishing frame, and an inflatable raft with floorboards. Sea Eagle Fishing Skiff 16. Drop stitch construction with a high PSI makes boat very rigid. The high pressure and construction keeps the boat very stiff. This boat is an example of a pure frameless inflatable fishing raft. More info at Sea Eagle. The Sea Eagle Stealth Stalker 10 is a high-pressure inflatable raft that uses floorboards to stiffen the raft. More info about the Stealth Stalker at Sea Eagle. So which raft to get? It all depends on your uses and your pocketbook. There is no “right or wrong” answer here. High Weight Capacity – Often exceed 1500 lbs. Seating allows (depending on raft) for 4-12 people in the raft. Larger the raft, the heigher weight capacity the raft has, and the more people can be in the raft. Expensive. 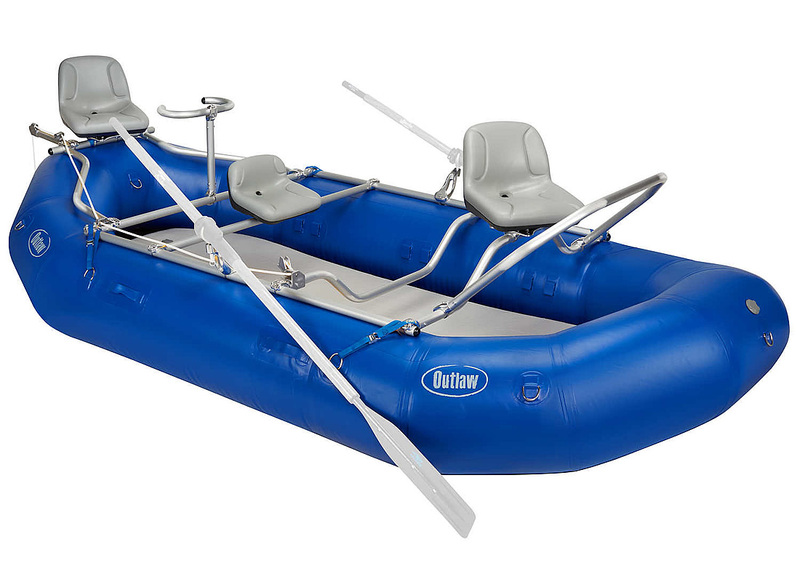 Need to buy both the raft and the frame, which usually costs a minimum of $2500 for quality inflatable rafts. Not easily portable. Typically these rafts are “trailered,” which limits put-in and take-out spots. Not quick and easy to setup for one person. These rafts are best inflated at the beginning of the season and then deflated at the end of the season. Self-bailing. This allows the rafts to run Class IV and Class V rapids (depending on the raft’s construction). These types of rafts are ideal for whitewater. Slow – Even with a motor. And not meant for long distance rowing across flat water. These rafts are best used in rivers. Most frameless rafts are limited to lakes, ocean bays and “sedate rivers” that have whitewater of Class II or less. Reasonably easy to row over shorter distances. But not meant for long distance rowing. To travel long distances, you’ll want a motor. The Sea Eagle Skiff 16 is especially well-suited for motors, and can reach speeds of up to 17mph with a 15hp motor. Designed for 1-2 anglers and for use on lakes and rivers with rapids up to Class II, the Stealth Stalker is, by far, the most portable inflatable fishing raft available. Made from tough 1000 denier (the same thickness as used one expedition level inflatable kayaks), these rafts will last a lifetime with proper care. Fully capable of being used for recreational river floating and overnight floats on rivers with up to Class II rapids. Do NOT use on rivers with stronger rapids. Raft is not self-draining. And the floorboards pose problems in whitewater. 5 foot beam (width) makes the raft very stable. 1 or 2 anglers can stand in the boat without fear of tipping it. Designed for larger lakes and ocean bays, the Fishing Skiff can use up to a 6hp gas motor to race along at up to 17mph. While the Fishing Skiff 16 may not look like a “true raft” since it’s isn’t rectangular in shape, make no mistake it serves the same functions. And unlike a traditional raft, this boat is meant to fish ocean bays and other sheltered ocean/big lake waters. Drop Stitch Construction allows for inflation to 15 psi, which makes the boat extremely stiff. Quite portable once disassembled, although all the parts to the boat will likely limit how often anglers want to assemble/disassemble the boat. Instead, most anglers are likely to keep the boat at least partially inflated while at home waters, and only fully disassembling it when traveling to new locations. 1700 lb weight capacity! Nearly a ton. Yet designed for 1-2 anglers. Allows for virtually unlimited amounts of gear onboard, should the need arise. Weighs just 100 pounds. A bit heavy for one person to manage but perfect for two anglers. 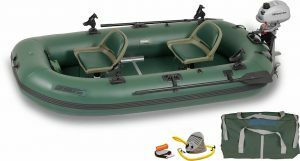 Sleek, front-taper design makes the raft much easier to row than other inflatable rafts, and allows for the boat to easily cut through water when under motor power. Very stable due to it’s length, hull design and 4’8″ width. This boat has been designed for open water fishing. Virtually any moderate to large sized whitewater raft can use a raft frame. Some frames are designed for heavy whitewater use. Other frames specialize in fishing. For those who desire a boat that works superbly for running rivers and heavy rapids, and need a boat with a large capacity, these rafts are the boat of choice. If you elect to buy a whitewater raft, be sure to first narrow down what raft frame can be installed on the raft. Not all frames work with all rafts. As for where to buy large, guide quaility inflatable rafts and raft frames, by far the best choice is NRS. NRS sells the highest quality rafts available, and their rafts are widely used by fishing guides and recreational float businesses.